A rare late fall and winter visitor to Tennessee, the Black Scoter is the only all black duck in North America. This scoter is very vocal, often being located from miles away by their constant, melodious whistle. It is an elusive species often found in mixed flocks. 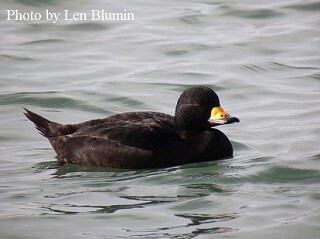 Description: The Black Scoter is a large, diving, all-black, migratory sea duck of North America. Males have a diagnostic bright yellow-orange knob at the base of its black bill. Females are sooty brown with full light cheeks and a dark cap and thin bill. In flight both sexes show a silvery-gray sheen that contrast with the black of the underwings. Black Scoters fly in straight and V formations with rapid, direct, strong wing beats their wings making a whistling sound. Voice: Male makes a mellow, song-like cour-loo,cour-loooo and in courtship will whistle. The female’s call is a low hoarse growl. Surf Scoter - Male has distinct white head patches, all black body and multi-colored large heavy bill. Female is dusky brown with white patches on sides of face and pale patch on nape. White-winged Scoter – female with similar whitish face patches, but has large white wing patch and sloping forehead. Male has red, white and orange bill with black knob at base and “teardrop” of white near his eye and the distinct white wing patch. Habitat: In Tennessee, Black Scoters can occasionally be found on freshwater lakes. Sometimes they are found among large flocks of waterfowl. Status in Tennessee: The Black Scoter is a rare migrant in early spring and late fall occasionally found in winter in Tennessee. Thought to be one of the most “musical” ducks, males make a melancholy, mellow cooing call.